Simply Gettysburg’s most unique lodging choice, the Doubleday Inn is the only Bed & Breakfast located directly on the Battlefield and offers the ideal setting for your relaxing historic get-a-way. Surrounded by history from the moment you arrive, you will immediately feel the sacredness of this ground and the significance of the events that happened right here. Our location literally puts history right at your doorstep, night and day. Enjoy beautiful sunrises and sunsets over land that is virtually unchanged from its 1863 appearance. The Inn shares an original rock wall boundary with Gettysburg National Military Park that marks the position of the Union First Corps troops during the afternoon fighting of July 1st. 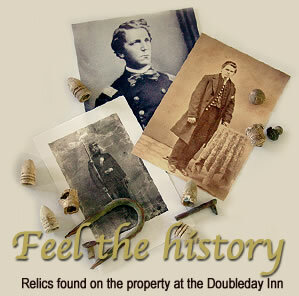 Why Stay at the Doubleday Inn? this year, sponsored by Celebrate Gettysburg magazine! We’ve been on this list since 2007!